Seedlings from the first two crosses have two chromosome sets (CC) from N. cavanillesii, one (V) from N. viridiflorus, and one (N) from a tetraploid standard daffodil. 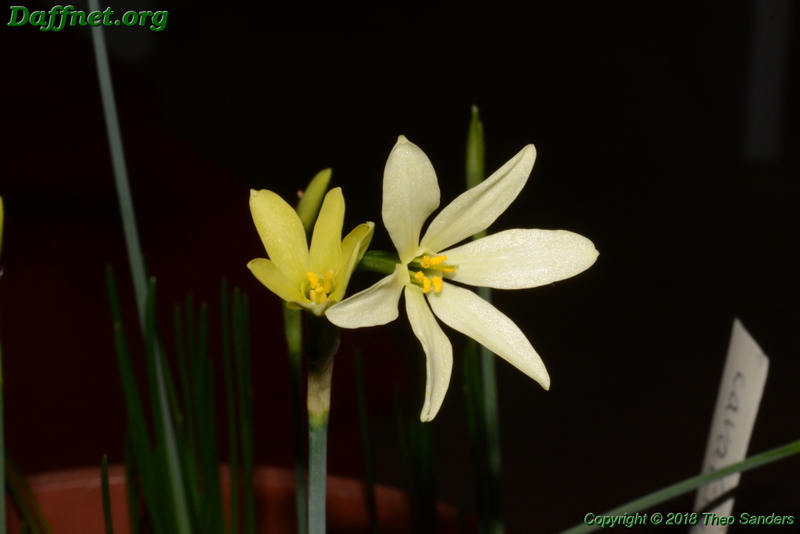 Seedlings of the third cross have two chromosome sets from N. viridiflorus, one from N. cavanillesii, and one from a tetraploid standard daffodil. This type with two chromosome sets of the same kind and two different is typically infertile. But in this group often some fertility can be found, as for example for many clones of N. x alleniae. This year nine seedlings of the first cross (CCVN) flowered and seven of them were pollen fertile with 10 to 20 percent. 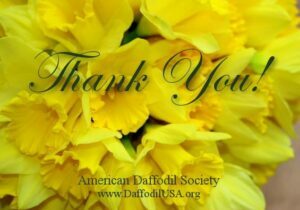 I described the first flowering seedling in my mail to Daffnet of November 3, 2014 as pollen fertile and found out that the pollen grains have the volume of N. cavanillesii. This result could not be reproduced. All seven fertile seedlings show a much bigger pollen volume with little differences only. I suppose that the chromosome constitution of the pollen is CVN. V and N may be a little different or perhaps even more different from the normal number of seven chromosomes. 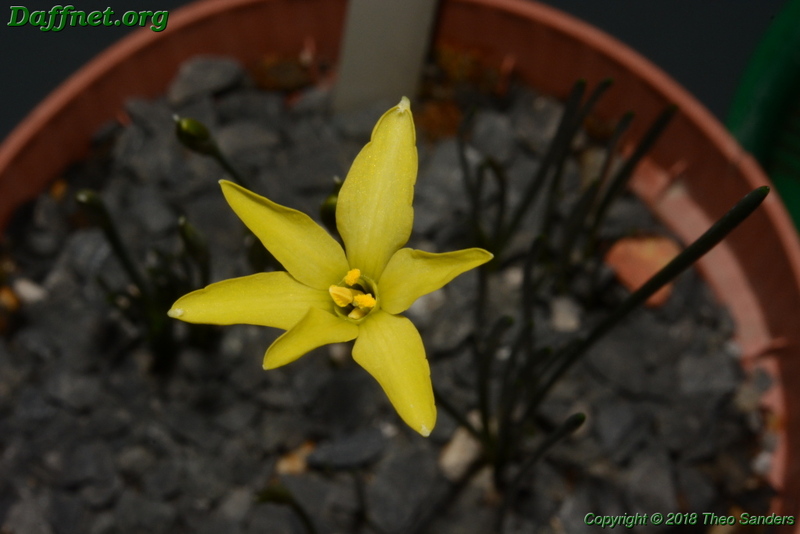 All seedlings have a ‘nearly absent crown’ and the flowers open yellow. Later on the colour changes to nearly white. From the second cross one seedling (also CCVN) flowered with a pollen fertility of more than 10 percent and, because of a pollen volume nearly as big as for the first five seedlings, with the same chromosome constitution CVN of the pollen. The blossom has a ‘nearly absent’ crown, but a constant yellow colour. 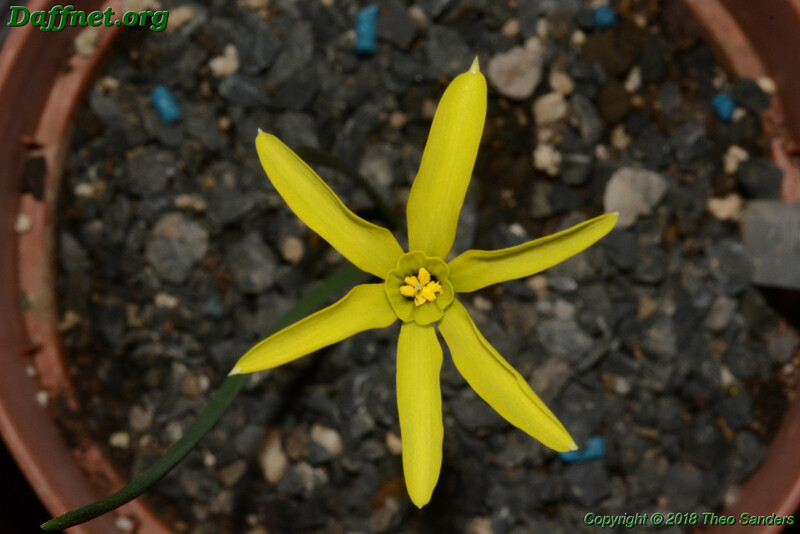 For the third cross one seedling (VVCN) flowered with a pollen fertility of nearly 20 percent and with nearly the same pollen volume as the other seedlings and the same chromosome compound CVN for the pollen, where C and N may be different from 7 chromosomes. The yellow colour of the flower does not fade. It has a nice little cup which means that the characteristic ‘ nearlly absent crown’ is not dominant. Interesting. Thank you for this entry Theo.